Completion of the new high level bridge at Zilwaukee will bring to a conclusion some 20 years of planning, designing and construction of one of the biggest and most complex projects ever undertaken by MDOT. It represents a significant engineering accomplishment. The project has encountered problems, some of them serious and most of them related to the 1982 accident. There have been no serious injuries and no lives lost, however, and the project, including the knowledge gained from the repair process, has provided much engineering experience of value to the entire highways industry. The bridge, when completed, will be safe, durable and efficient, ready to serve the motoring public for many years to come. It will replace an obsolete, inadequate drawbridge that has caused numerous accidents and endless traffic delays over the years. And it will easily accommodate the more than 31,000 vehicles that travel along that section of I-75 freeway every day. Has responsibility for the design, construction and maintenance of the 9,500-mile state highway system--all the Interstate and US- and M-numbered highways. FHWA, a part of U.S. DOT, administers the U.S. Highway Trust Fund, which provides 90 percent of the money for Interstate System projects. S. J. Groves & Sons, Minneapolis, Minn.
Prime contractor for the final construction of the Zilwaukee Bridge. Howard Needles, Tammen and Bergendoff, Kansas City, Mo. A private consulting engineering company retained by MDOT to provide expertise in construction of the bridge. A private consulting engineering company retained by S. J. Groves & Sons as its consultant at the bridge. Owner: Michigan Department of Transportation (MDOT). Designer: Bouvy, van der Vlugt & van der Niet/Segmental Technology & Services (BVN/STS), Indianapolis, Ind. Length: 8,066 feet northbound, 8.090 feet southbound. Width: Two roadways, northbound and southbound, each 70 feet, 10 inches wide, allowing for four traffic lanes and an 11-foot, 5-inch shoulder in each direction. There is a 5-foot, 3-inch separation between the two roadways (superstructure decks). Underclearance: 125 feet above the Saginaw River (slightly higher at mid-point). Design: Segmental concrete using 1,592 pre-cast concrete segments fabricated in a plant built on the bridge site. Each segment averages 10 feet in length, is 73.5 feet wide and weighs up to 160 tons. They are erected using a post-tensioned system of steel cables, supplemented by epoxy for joint sealing. There are 25 spans on the northbound bridge and 26 on the southbound bridge, varying in length from 155 to 392 feet. In addition, the bridge will have a 405-foot long, three-span ramp bridge to carry traffic onto the southbound roadway. Substructure: Two-column vertical concrete piers supported by 200-ton capacity pilings. There are 52 such piers supporting two roadways. Materials Quantities: Approximately 150,000 cubic yards of concrete, 22 million pounds of reinforcement steel, 4,000 miles of half-inch steel cables. Traffic: Existing four-lane drawbridge carrying I-75 over the Saginaw River was designed for 20,000 vehicles daily. Current traffic is approximately 31,000 daily. Current Contractor on the Bridge: S. J. goves & Sons of Minneapolis, Minn. 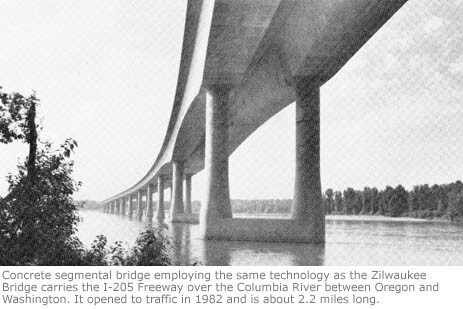 Status of Construction of May 1, 1987: The bridge is about 80 percent completed. A total of 1,233 of the 1,592 concrete segments have been erected. The northbound bridge is completed except for the outside railings and special concrete covering to be placed on the bridge deck. Consultants: The contract requires both MDOT and the contractor to have consultants on the bridge site during the construction. The department's consultant is Howard Needles, Tammen & Bergendoff of Kansas City, Mo. Contractor's consultant is T. Y. Lin International of San Francisco. Bridge Cost: $117.5 million, less the amount to be realized from the sale of the department-owned fabrication plant and equipment. This is estimated to be worth at least $3 million. Another $9.8 million will be spent on approaches and ramps. Federal funds are paying 90 percent of the cost. — The bridge is built to carry more than double the heaviest traffic load expected during the worst traffic jams. — In addition to the traffic load, the bridge is built to carry its own weight plus an additional one-third of its weight. — During construction, the bridge gets its most severe safety test almost every day. Structurally, the bridge is weakest during construction, yet it is now carrying loads far greater than it will ever carry when opened to traffic. The equipment used to attach new segments to the bridge, plus the truck loaded with a segment, weighs about 1,962 tons--nearly 4 million points. To create the same weight in the same space on the bridge would require lining up 49 fully loaded 18-wheel trucks and trailers bumper-to-bumper across four lanes. — Specifications for the bridge deck segments require concrete strength of 6,000 pounds per square inch (psi), compared to 4,500 psi for other bridges on the state highway system. The actual strength of the concrete is 10 percent higher than 6,000 psi and runs as high as 7,700 psi. — To protect them from corrosion, all the high-strength, post-tensioned steel tendons inside the bridge are completely encased in concrete. — A special covering of latex-modified concrete will be placed on the bridge deck, providing further protection against corrosion. — A non-corrosive salt substitute--calcium magnesium acetate--will be used for snow and ice control after the bridge is opened to traffic. — The epoxy used as joint sealant is fire-proof and, when it hardens, is stronger than concrete. Maintenance and Inspections: MDOT is developing an intensive maintenance plan for the bridge for use once it is opened to traffic. It will be based on a detailed maintenance manual of the type that has been developed for other major bridges, including the Mackinac Bridge, International Bridge and the Blue Water Bridge. MDOT will hire an expert consultant to do a maintenance inspection on the bridge at least every other year. In addition, a special MDOT design and engineering team will make inspections throughout the year. Nova Scotia Bear River Annapolis Cty. Source: Federal Highway Administration, Washington D.C.